From the moment you walk into our casual and friendly office, we hope you’ll feel right at home. Our office staff will immediately welcome you and invite you to fill out our new patient paperwork, which takes a few minutes of your time. After, we’ll input all of your information and take you back to meet with Dr. Crouse. During your first visit with Dr. Crouse, he’ll review your paperwork to get a better understanding of what brought you in and ask you questions about your pain or injury. It’s important that we understand as much about your reasons for seeking care as possible, so Dr. Crouse will perform an examination and most likely x-rays to better serve you and give you the best care possible. If your X-ray’s appear to make you a great fit for chiropractic care, Dr. Crouse will then perform a conservative and gentle treatment, which may consist of a light adjustment or intersegmental traction therapy. You can expect your first visit to last roughly 45 minutes. 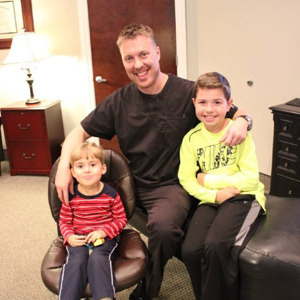 For our younger patients, we go out of our way to be extremely gentle and comforting during the first visit, and will try to make it a fun experience for your child! After your first visit, we usually like to see you for another treatment in the next couple of days to see how you’re feeling and perform a second adjustment. This helps us gauge your rate of recovery and make any necessary changes in your treatment plan. We’ll also review your X-ray’s with you and give you the opportunity to ask us any questions you may have. To help in your recovery, we may send you home with stretches or exercises to promote further healing. From here, we can discuss ongoing care and will outline a treatment plan that will suit your needs. Visits after this point are usually complete in just 15 minutes or less. Many patients choose to continue wellness care after they’re out of pain to help stabilize the problem area and strengthen their body to prevent the injury from happening again. Sometimes, this is as little as visiting us once each month for an adjustment. If you’d like to stop receiving care after you’re feeling better, that is perfectly fine too–the choice is completely up to you! Our Hickory chiropractor accepts most insurance plans including Medicare and Medicaid. With late appointments available and walk-ins welcome, there’s no reason for you to stay in pain any longer. Contact our practice today to schedule your appointment!